Despite having a website is full of recipes, in real life at least half of my meals are “sweep the kitchen” or “throw together whatever you have” type meals. Even though they’re not exactly “recipes” I like to highlight them every now and then because they can be a great reminder of ways to use up leftovers, and they can be super helpful to newbies who are still learning their way around the kitchen. 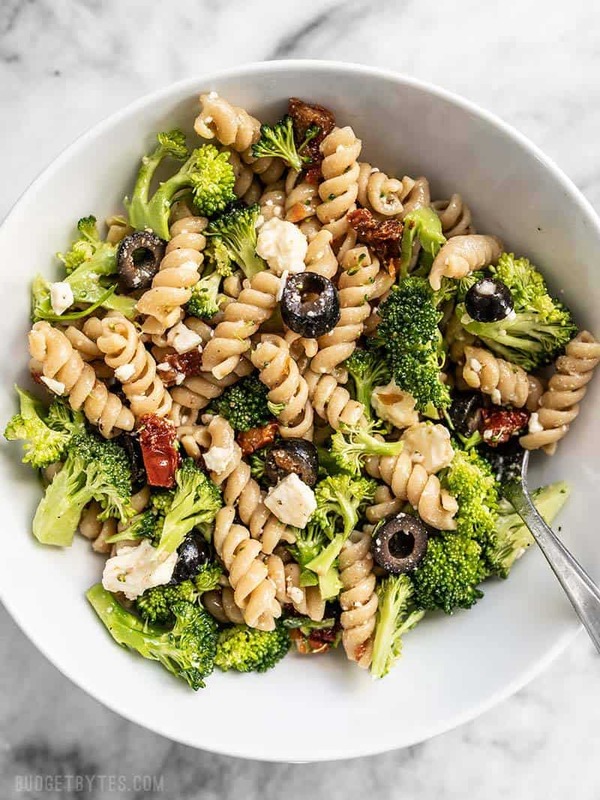 This “Sweep the Kitchen” Pasta Salad is nothing profound, but it’s a great demonstration of how fast, easy, and versatile pasta salads are, and just how awesome they are to have on hand for quick meals throughout the week. I’ve been really under the weather the past few days but even *I* can make something this simple to stock my fridge for the week. So, when it doubt, throw together a pasta salad! My favorite reason for making these pasta salads is that they hold up so well in the refrigerator. Even when I’ve added fresh baby spinach, they some how don’t get wilted. 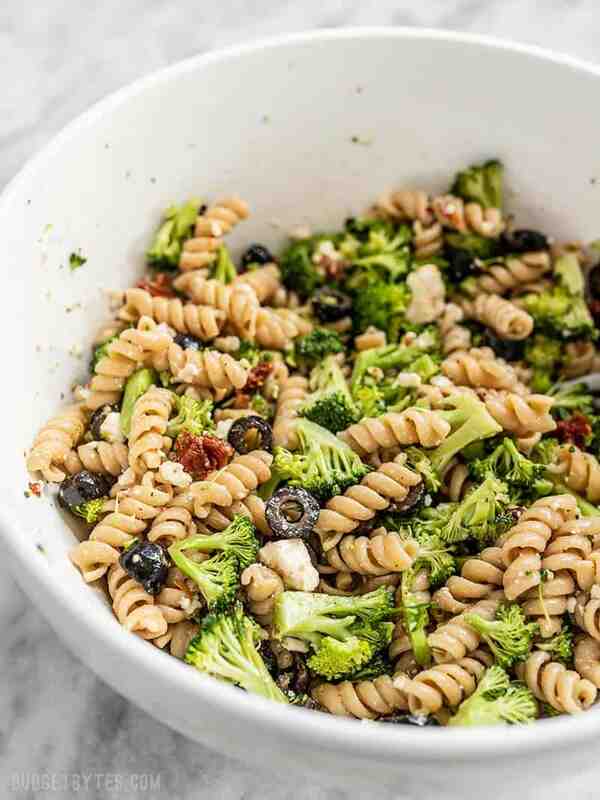 I love the broccoli in this version of the “Sweep the Kitchen” Pasta Salad because it’s crunchy but also sort of marinates in the dressing. It’s just fab. Want more refrigerator salads? 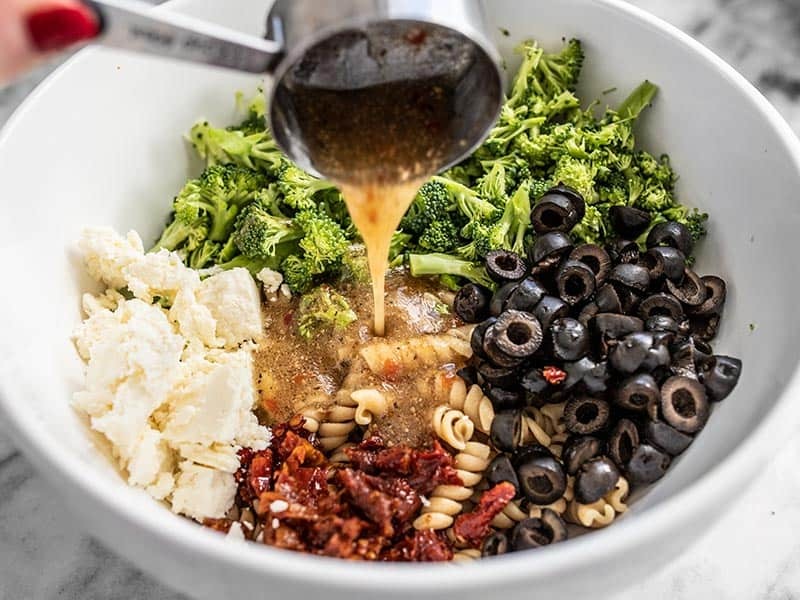 Try my Roasted Cauliflower and Quinoa Salad, Italian Orzo Salad, Make Ahead Kale, White Bean, and Pesto Salad, or Spinach, Chickpea, and Quinoa Salad. Throw together meals like this “Sweep the Kitchen” Pasta Salad are my favorite way to use up leftovers in the kitchen. Easy, versatile, and never boring! Cook the pasta according to the package directions, drain in a colander, then rinse briefly under cool water to bring the temperature down. Let the pasta drain well. While the pasta is cooking, finely chop the broccoli, drain the olives, and roughly chop the sun dried tomatoes. 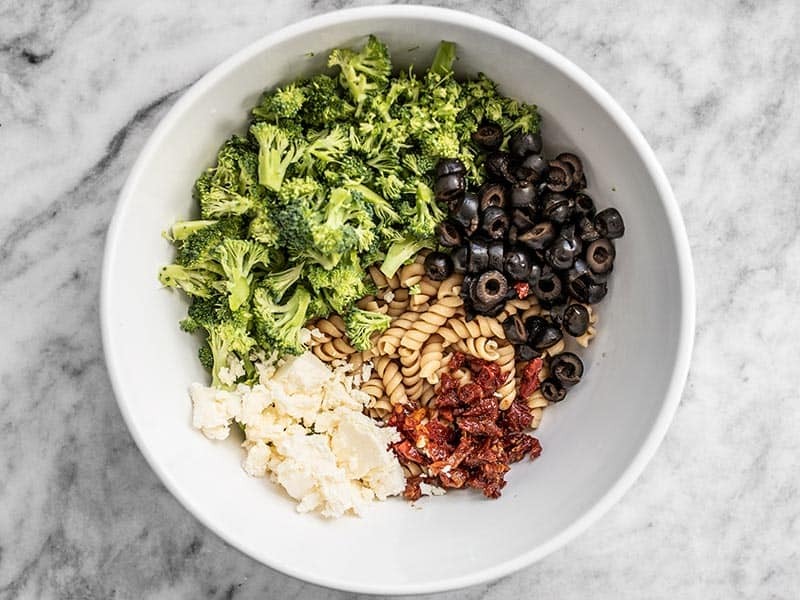 Once the pasta is well drained, add it to a large bowl along with the chopped broccoli, drained olives, chopped sun dried tomatoes, and crumbled feta. Pour the Italian dressing over top and stir until everything is combined and coated in dressing. Serve immediately or refrigerate for up to 4-5 days. This recipe makes about 6 cups. 3 meal-sized portions or 6 side dish sized portions. Cook 8 oz. pasta (any shape) according to the package directions, then drain it in a colander, and rinse it briefly with cool water. Let the pasta drain well. While the pasta is cooking, finely chop one crown of broccoli (about 1/2 lb. ), drain a 2.25oz. can of sliced olives, roughly chop about 1/4 cup sun dried tomatoes, and crumble 2 oz. feta. 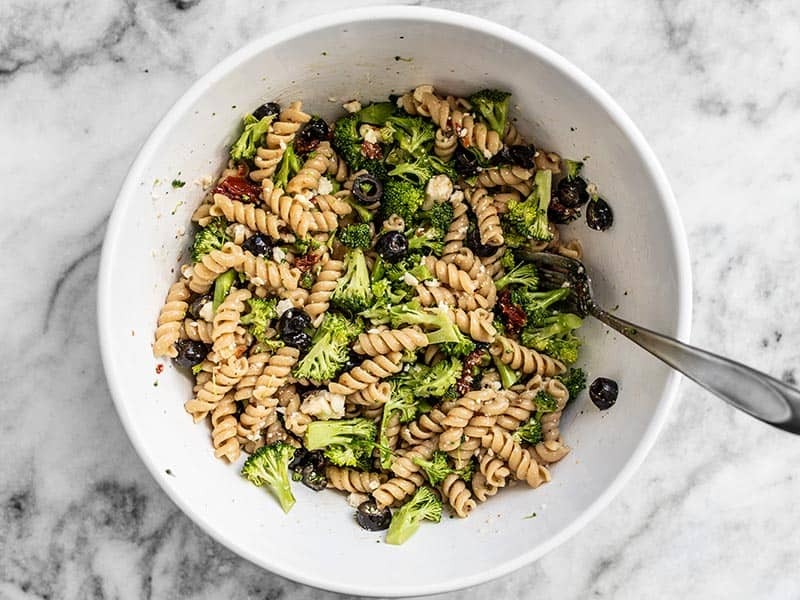 Once drained, add the pasta to a big bowl with the broccoli, olives, tomatoes, and feta. I used a store bought salad dressing this time. 🤪 I know that might shock some of you, but even I don’t make everything from scratch all the time (like on days like today when I’m sick). Plus, I haven’t found a homemade Italian dressing recipe that I absolutely LOVE yet. 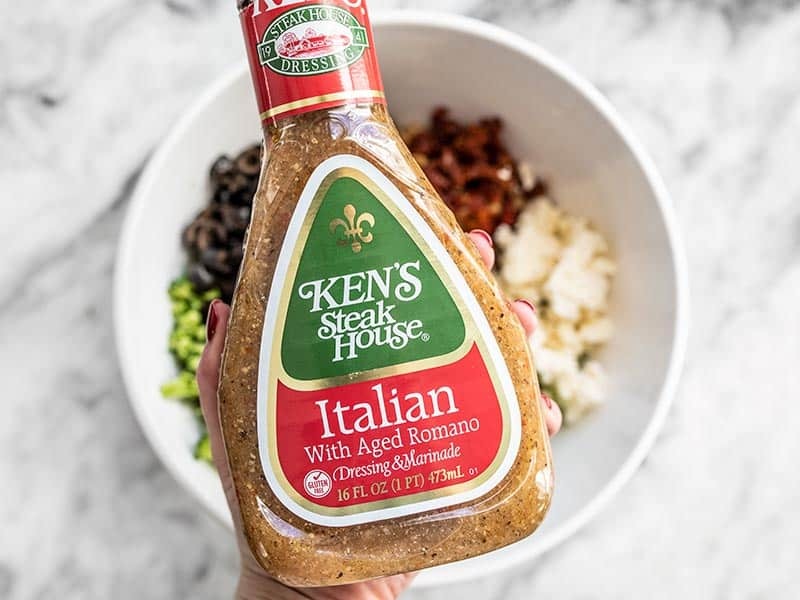 When I do opt for a bottled dressing, I usually stick to either Girard’s or Ken’s Steak House because they both tend to have pretty good flavor without being outrageously priced. Stir until everything is combined and coated in dressing. And that’s it! Eat now or refrigerate for later. Pasta salads for the win! What is your favorite pasta salad combo? I’d love to hear more ideas, so share yours in the comments below! 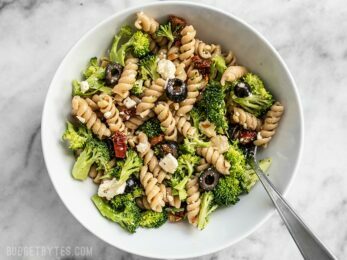 The post “Sweep the Kitchen” Pasta Salad appeared first on Budget Bytes.